The Indian footwear is growing at over 10% annually, with the organised segment growing at almost double the industry. Domestic footwear market, estimated at ~Rs 250-300bn, posted CAGR of 10% over 2006-11, With increasing consumption, growing popularity of online shopping, higher affordability and rising income level, per capita footwear consumption is expected to rise to 2.2x from present of 1.87x. Indian Footwear market is the third largest in terms of pairs sold after China and the United States. 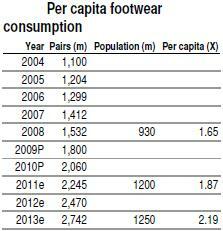 The chart below shows rising per capita of footwear / shoes consumption in India. The organized footwear retailing comprises 30-35% of the industry, is growing at double the industry growth rate on account of – 1. growing presence of organised players in tier I and II cities where consumption power remains high, 2. Expanding and continuously growing women and kids sections (Women at 40-41% and kids 11-12% of industry, respectively). With rising urbanization and better education levels amongst women, there has been a phenomenal rise in women workforce, creating demand for branded footwear 3. rising online shopping (8% of industry, at Rs 20bn) amongst 20-35 age groups. Market Leader Bata and Relaxo are even looking at opening dedicated stores for women / kids in future. Bata’s e-commerce business is currently less than 1% of its total revenue, which the company intends to grow faster. The Indian footwear market is extremely price sensitive. The organized players have, therefore, categorized product segments based on pricing into affordable and premium. Branding enables them to garner higher realization and margin. International players eye the higher end of the spectrum, with the lower end being catered to by domestic players. Sports Market – Target price of Rs 1,000-3,000 is dominated by international companies Nike and Adidas , Reebok had some setback lately.